What Direction is Japanese Written? 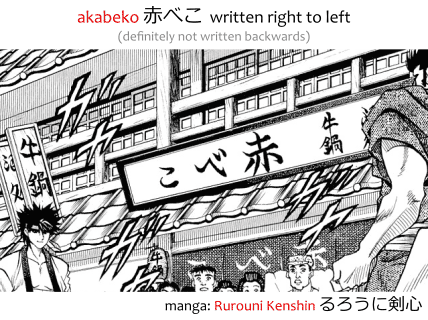 You may have heard that Japanese is written top to bottom, right to left, but is that really true? Is the Japanese writing direction vertical instead of horizontal? Or is it written the same way as English, left to right, top to bottom? Which one is it? In English we always write horizontal lines, starting from the left and going to the right, which wrap vertically, from top to bottom. In Japanese we can write like this, but we can also write vertical lines, starting from the top and going to the bottom, which wrap horizontally, from right to left. Even though these two ways are completely different, both are used in modern Japanese! By the way, in Japanese the "vertical writing" is called tategaki 縦書き, while the "horizontal writing" is called yokogaki 横書き. The words tate 縦 and yoko 横 mean "vertical" and "horizontal" respectively. And gaki 書き, "writing," comes from the verb kaku 書く, "to write." When Is Japanese Written Vertically and Horizontally? Mangas, light novels and novels usually feature only vertical text or primarily vertical text with some horizontal text, though there are exceptions. Books and school textbooks tend to be horizontal text, however, textbooks about the Japanese language (national language textbooks) are usually written in vertical text. Programs and software are almost always horizontal text only and simply don't support the vertical layout. The rare exceptions are text-editing and design software like Microsoft Word, Adobe Photoshop and Illustrator. Any forms with OK / Cancel buttons are going to be horizontal. Games and visual novels are also horizontal. Websites always feature horizontal text only. This includes Niconico, 2chan, Pixiv, etc. Today, as of 2017, the technology to display vertical writing in webpages instead of horizontal is still considered experimental. Some traditional banners and signs of stores feature vertical writing, though horizontal writing is also quite common. Magazines and newspapers tend to have a mix of horizontal and vertical. The graphics text on covers of books, manga, movies and other products also feature mixed styles. Sometimes one, sometimes the other, sometimes both. Generally speaking, vertical writing is more traditional while horizontal writing is gaining popularity. Both styles are used. Some stuff will be one style only, some stuff will mix both. It really varies. Why Is Japanese Written Horizontally and Vertically? Now you may be asking yourself: "but why?" Why would anyone even need two different ways of writing text? I mean, come on Japanese, if you are going to do this, at least do vertical from left to right instead of from right to left to maintain some consistency. You're inverting everything here! Well, what happens is that, traditionally, Japanese was written vertically, top to bottom, right to left. That was the original way of writing Japanese. It was only after the contact with the west that the horizontal Japanese was born. Imagine a medieval messenger with a scroll in hands. He'll read it out loud to the king. How does he open the scroll? Vertically, of course! When writing the scroll the lines are written across the width and they progress through the length. However, if you imagine an ancient oriental scroll, you'll imagine it opening sideways, like a treasure map, because the writing is vertical. Japanese began being written horizontally when it was put in multi-language dictionaries in the 19th century. Since Japanese was vertical but western languages were horizontal it was difficult to put a word and its translation side by side, so writing both languages in a same way became necessary. Some dictionaries had English written vertically, rotated 90 degrees, while others started writing the Japanese horizontally. So Japanese started being written horizontally, but the question is: how? After all, even if the lines wrap vertically, we still have to choose between writing from right to left or left to right. The answer was, of course, both ways, because it had to be this confusing otherwise it wouldn't be Japanese. When Japanese text that was used mixed with English or other left to right languages, the identical left to right layout was used. But when Japanese was written horizontally by itself, in titles of newspapers and signs of stores, etc. it could be written right to left instead! This is specially confusing because it's not like we are inverting the entire text horizontally. We are just writing it backwards. It's like if you read "doog kool" written somewhere and tried to figure out what kind of pet shop you are staring at only to realize it actually says "look good" backwards. 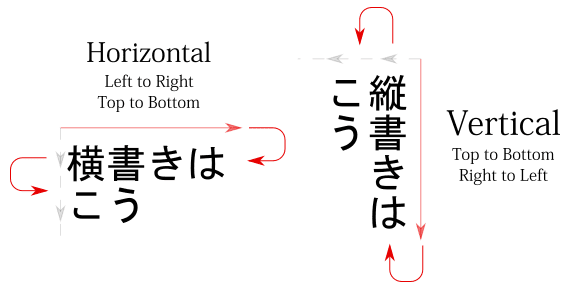 After World War II, horizontal Japanese writing became standardized and the right to left layout stopped being used. Now only the left to right layout is used, but you can still find right to left lingering around from time to time. From there on there probably were many factors contributing to the horizontal Japanese usage, but I'm guessing none of them were as important as the advent of computers. With computers gaining tremendous popularity and necessity, and with the explosion of internet, cellphones, smartphones, e-mails, messaging and instant-messaging, etc. the Japanese people were forced in contact with a thing that just couldn't do vertical text. Most software was and still is horizontal-only, which probably gave a push towards horizontal acceptance. Further, the Japanese alphabet was originally designed to be written vertically and writing it horizontally must have felt weird at first, but today this is no longer the case. Like I said, the internet is horizontal only, and in the modern world most things you read are on the internet. The young people of Japan today have grown used to the horizontal way of writing and some of them even find it weird that Japanese is sometimes written vertically. Yes, it's kind of ironic, but a similar thing also happens to the way Japanese people write their Japanese years. The tendency seems to be for most Japanese text to become horizontal in the next few decades. how do I write Shibui in janenese vertically?